If I would list the list of cartoon in my childhood, Thundercats will be in the top 5. I would say back then it was the animation one of it's kind. What will you remember most of a cartoon? It goes without saying the starting intro of course. And Thundercats just hit on that. Watching that barely 1 to 2 mins intro will make a believer of Thundera out of you! In that intro, the artwork, movement, screenplay and the theme song made one Master piece. The pace was quick, introduce the main characters with such energy. To top it of, it show the cool design logo at the end. I am certain many like me won't even want to miss the intro or got tired of getting excited all over again. I came to realize that the animation was created by the a collective of Japanese studios and some of them later form Studio Ghibli. No wonder Thundercats story and cartoon was different from He-man which was more to the Medieval period. The story and the characters were well planned. Somethings that almost never failed in every episode, you will get to see Mumm-Ra chanting the "Anicent Spirit of Evil" thingy for transformation and Lion-o doing the eye of Thundera thingy or the "Thunder, Thunder, Thundercats" thingy. Well I'm not complaining. I looked forward to that as a kid so that I can do it together. By the way, I only remember catching the cartoon on neighboring channel (TV3). I don't remember local SG channel aired Thundercats. Some body can confirm that? Thundercats theme song was one of the kind and George Lam, a popular Hongkong Canto Pop of 1980s did a cover on that in his Cantonese album and it was well received. A handsome figure that comes with the Sword of Omen which had the eye of Thundera that give will produce the Thundercats symbol in the night sky. A Claw Shield... I don't want to know how a claw can be a shield... and a mini-power plug that will power-up and lightup Lion-o's eyes. 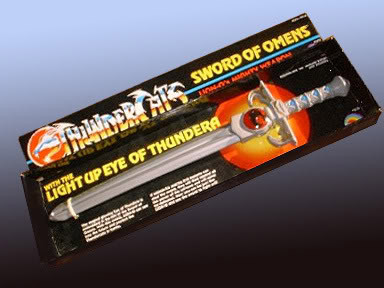 Action figure aside, nothing beats the fun of playing with the Sword of OMEN. 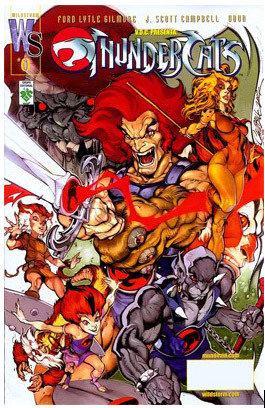 Not too long ago, Thundercats returned to comic by Wildstorm and I guess it was a starting of a revival for Thundercats. That set the pace for the CGI animation which is schedule to release on the summer of 2010 by Spring Creek Productions. Fans, Let's cross our fingers that it will be as good as it's former glory if not better...especially the TOY!! You want to know what is the Thundercats effect? Fill in the blank in the following. 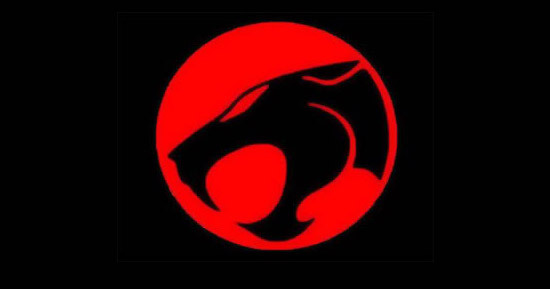 When the Thundercats see the logo, they will say "Thundercats, __ !" Come on, you know you want it. :P See that is the Thundercats Effect... HO! Yeah correct, Thundercats was only shown on TV3 back then, same with Voltron (5 lions), She-ra, Punky Brewster, Popples. Wildfire, etc. I love all these cartoons and they were not well-known among the Singapore kids because the SG channels didn't show them in the 80's. Yes. I remember my dad got a special antenna (D.I.Y actually) just to receive TV3 in SG back in the 80s. Yes really famous. I still remember TV3 station title song. Back then Malaysia was offering more Kids entertainment. I recall the Ultraman and kamen rider(aka Masked rider) all were in Malayu but I still watch it regardless I dun understand Malayu. That's a really cool sword! haha no it's a japanese artist, who does a lot of manga/anime art. tellll me about it! i'm just happy i'm safe, and my car was untouched. my no 1 cartoon! love it and looking fwd to the movie. You can try your luck at the comic shop at Serene center along bukit timah. 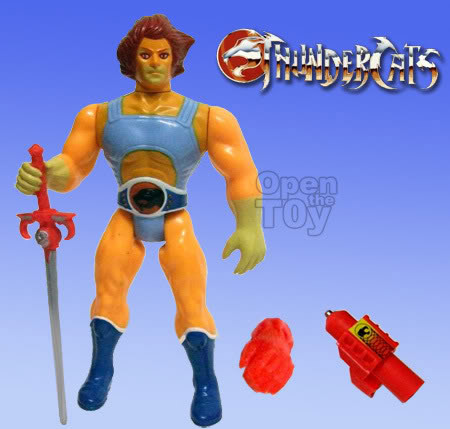 even though i was a younger adult back in the 80's, I still remember Thundercats HO! what great memories and I was married w/2 stepkids and 1 of my own. Wife couldn't understand my facination w/such things, she still doesn't. another that came out around the same time was Silverhawks. Do you remember that one?